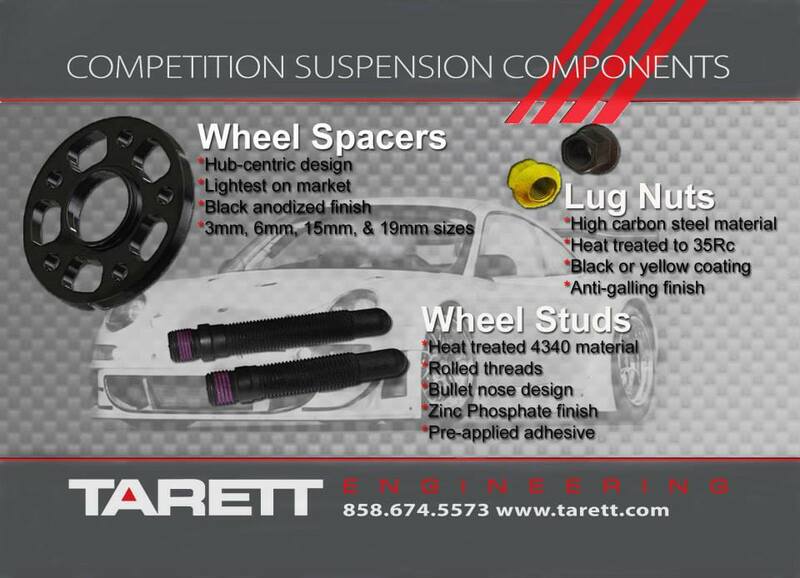 New products introduced by Tarett Engineering Competition Suspension Components, and available from us here at CCR Motorsports Engineering. These are by far the highest quality wheel studs on the market today. Made from aerospace quality 4340AQ chrome molly steel, and heat treated for maximum strength.The threads are rolled for additional strength. The result is a no-compromise NASCAR quality competition wheel stud that is highly resistant to wear and damage. The extended bullet nose holds the lug nuts in place and guides them on with no chance of cross threading. With a 14.7 mm shoulder design to seat precisely and firmly on the hub, and finished with a zinc phosphate and oil coating to prevent oxidation and provide consistent torque values and loading. Pre-applied anaerobic micro-encapsulated adhesive to hub end threads. Used to convert all 1997 to 2013 Porsche 986/996/987/997 to a studded hub design. Manufactured by a leading supplier to the NASCAR industry, these are the best lug nuts available. Machined from high carbon steel and heat treated to a 35 Rc hardness. The custom baked on manganese phosphate coating provides lubricity for consistent torque values and anti-galling properties, and is available in black or yellow for high visibility in the pits. A must have part for competition use. Fits all Porsche 911/914/944/964/993 and 986/996/987/997 with a studded hub design.